The Interbrand Best Global Brands survey was recently released, (September 30,2013)……Founded in 1974, Interbrand is the world’s leading brand consultancy! Bloomberg BusinessWeek notes,Coca Cola the soft drink giant had held the No. 1 ranking for 13 consecutive years but fell to No. 3 in this year’s report. Interbrand values the Apple brand #1 at about $98 billion, and other tech companies such as #2 Google, #4 IBM, and #5 Microsoft finished rounded out the top five. 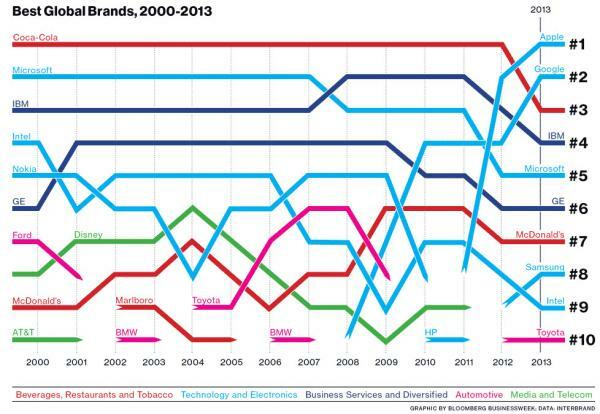 Here’s a look at the twists and turns of the top 10 brands in the Interbrand study, which analyzes a brand’s financial strength and influence, going back to 2000.